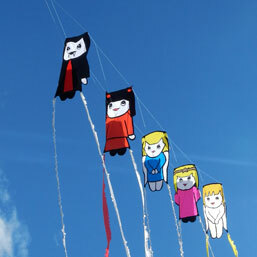 Sky Bums flat kites come in a wide variety of shapes and sizes and are inspired by traditional designs as well as our own imagination. The covers can be bold, graphic shapes and colours or intricate applique work. The smallest are ideal for children (of all ages). The larger ones can lift items such as aerials, cameras, windsocks and parachuting teddies into the sky. Many items we carry in stock as standard but special one off designs can be built (see below) or found on our specials page.